But revised estimates show the GDP rose 2.3 percent for all of 2017, a significant pickup from 1.5 percent the previous year. WASHINGTON — U.S. economic growth was revised slightly downward to a still-solid 2.5 percent annual rate in the final three months of last year, as businesses spent less on investment and restocking shelves than the government had previously estimated. The fourth-quarter advance in the gross domestic product, the economy’s total output of goods and services, followed even faster increases of 3.1 percent at a seasonally adjusted annual rate in the second quarter and 3.2 percent in the third quarter, the Commerce Department reported Wednesday. Consumer spending raced ahead at the fastest pace since the spring of 2016, although some of the components such as purchases of furniture and clothing were revised lower. However, these declines were offset by stronger spending on services such as utility bills. Factors in the downward revision included a greater slowdown by businesses in spending to build up their stockpiles and weaker business investment on structures and intellectual property. The various small revisions pulled down GDP from the initial estimate of 2.6 percent growth. 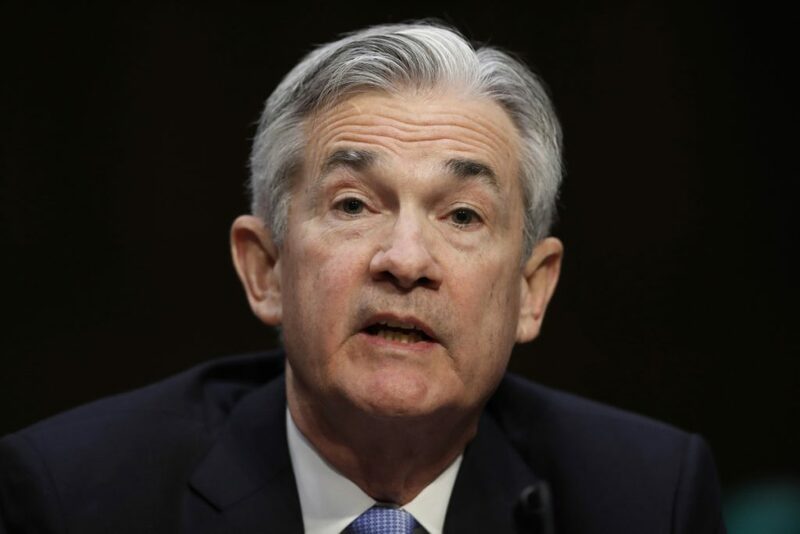 Economists said the small changes were unlikely to change the upbeat assessment of the economy that Federal Reserve Chairman Jerome Powell delivered Tuesday to Congress. “The Fed already knew that the economy had healthy momentum to end 2017 so this does little to change its thinking on the outlook,” said Leslie Preston, senior economist at TD Economics. For the year, GDP rose 2.3 percent, a significant pickup from 1.5 percent in 2016, which had been the slowest annual growth rate since the economy contracted in the recession year of 2009. President Trump has often pointed to the pickup in growth last year as evidence that his economic program of tax cuts, deregulation and stronger enforcement of trade deals was working. During the campaign, Trump promised to double growth, which has averaged a lackluster 2.2 percent annual average since the recession ended in mid-2009. The current expansion is now in its ninth year, making it the third-longest on records going back to the 1850s, but it has also been the slowest in the post-World War II period. Trump has said he expects to achieve GDP growth of 4 percent or better, although his new budget is based on an expectation that the economy will expand at average annual rates of 3 percent over the next decade. The 3 percent GDP forecast has been challenged as overly optimistic by private forecasters, who point to the retirements of the baby boom generation and lagging productivity as factors likely to constrain GDP growth. Many forecasters have boosted their expectation for growth this year and next year, based on the boost they believe will come from the $1.5 trillion tax cut package that Trump pushed through Congress in December and the $300 billion in extra government spending added to this year and next year by a budget deal that Congress approved in January. Analysts expect the increased stimulus to help lift GDP to 2.5 percent growth this year and next year. But analysts think those gains will fade after 2019, as the economy is held back by higher budget deficits and rising interest rates engineered by a Federal Reserve that will be trying to slow the economy to make sure inflation does not get out of control. In his public debut as chairman of the Federal Reserve, Powell said Tuesday that “further gradual increases” in the Fed’s key policy rate will be the best way to keep the economy from overheating while at the same time achieving the Fed’s goal of having inflation rise at a moderate pace of 2 percent per year. But many analysts believe the Fed will boost rates four times in 2018, with the first increase coming next month. That would be up from three rate hikes in 2017.